London's iconic black cabs may soon become a common sight on the streets, with Geely producing the TX4 in China. HANGZHOU, China (Reuters) -- London's iconic black cabs may soon become a common sight on the streets of inland Chinese cities where many people have only had a glimpse of the bulky British car in Alfred Hitchcock movies. Geely Automobile Holdings, a major Chinese indigenous carmaker and its British partner Manganese Bronze Holdings PLC, plan to sell about 1,000 of these cars in China this year. At a sprawling manufacturing facility in the suburbs of Shanghai, workers are busy producing TX4 models, which hit the market last week and have already secured more than 200 orders from corporate and private buyers in China. "Our customers are mostly wealthy people buying the cab for their loved ones. Driving a classic black cab can attract a lot of eyeballs. There aren't many out there in the streets," said Jinliang Lau, general manager of Geely group's sales arm. Apart from selling black cabs to hotels and wealthy private owners, Geely is also lobbying local government and taxi operators in major cities all over the country. "We have 30 black cabs in service in Beijing since the Olympics and they are quite popular among local residents," Lau told Reuters at Geely's headquarters in Hangzhou, nearly four hours' drive from Shanghai. "We are in talks with other cities, mostly provincial capitals, and would hopefully get the cab in cities such as Lanzhou and Chengdu before the end of the year," Lau said, adding he had secured an initial order of up to 50 TX4 models from the local government in the northwestern city of Lanzhou. Lau said he aims to boost sales to between 3,000 and 5,000 units annually in the next two to three years, from around 1,000 in 2009, to corporate and private buyers as well as taxi operators. 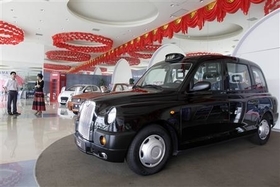 The Shanghai-made TX4 is priced at between 198,000 and 228,000 yuan ($28,970-33,360), roughly a third less than what it costs for a made-in-Britain model. Manganese Bronze, which has manufactured more than 100,000 black cabs at its Coventry plant in England since 1948, turned to Geely in 2006 as high manufacturing costs of the vehicle limited its growth overseas. The partners struck a 53 million pound deal, which gave Geely 52 percent of their Shanghai venture and a 23 percent stake in Manganese Bronze. The British side has 48 percent of the venture and the rights to sell black cabs outside Asia. The venture, which started commercial production in January, has designed annual capacity of up to 20,000 units, roughly 7 times as much as Manganese Bronze's Coventry facility, company data show. Under the agreement, it will also supply more than 90 percent of components for the London taxi production. Savings for UK-produced TX4, incorporating Chinese components, are expected to be 2,000 pounds ($3,272) per car by the end of 2009, Manganese Bronze's chief executive John Russell had said. Industry analysts see the partnership as a win-win deal as it also provides Geely, already exporting to more than 50 countries, mostly in the developing world, a chance to break into mature markets in Europe and the United States. Many Chinese automakers, including state-owned big auto groups such as SAIC Motor Corp and Dongfeng Motor Group Co, have set their sights on mature markets, hoping to emulate the success of Toyota Motor. Geely, known for making China's most economical car priced as low as 29,800 yuan ($4,360), cheaper than a vehicle license in Shanghai, has never kept its ambitions of being a global player a secret. It rolled out several higher-end models during the Shanghai auto show in April to take on foreign auto brands, such as Volkswagen AG, which currently dominates the lucrative mid-to-higher end segment in the country. "We have been making cheap cars for 10 years. But we started to change our strategy since mid-2007. Like our chairman Li Shufu had said, we now want to make the best, safest and most environmentally-friendly cars," added Lau, also vice president of Geely group.